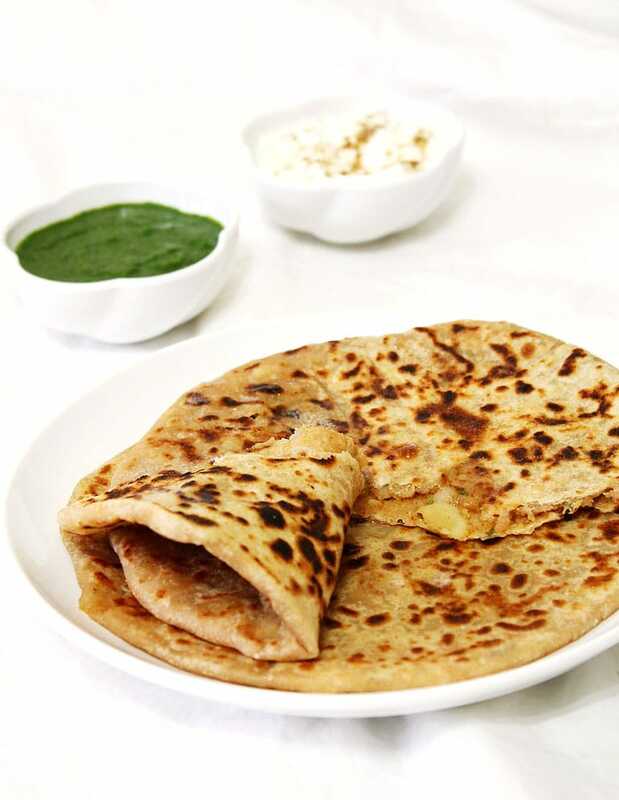 This is the BEST and easy to make punjabi aloo paratha recipe with step by step photos. This is Indian stuffed flatbread where the outer layer is made from whole wheat flour and stuffing is spiced potato mixture. The simple and quick stuffing version where boiled potatoes are mashed and added few spices. That’s it, the stuffing is ready. Add a teaspoon of anardana powder, it tastes too good. You can also add a teaspoon of kasoori methi. Instead of amchur powder, you can use lemon juice. You can add a tablespoon of mango pickle (achaar) masala to the stuffing. This variation is my mom’s: Saute onion, green chili, ginger garlic paste in oil. Then mix in turmeric powder, spices, and boiled potatoes. It is similar to batata vada mixture. Along with onions, you can add veggies like finely chopped bell pepper, grated carrot, cauliflower, broccoli, boiled mashed peas, chopped spinach, methi leaves, beet greens or any other leafy vegetable. You can add grated beetroot like this beetroot paratha. 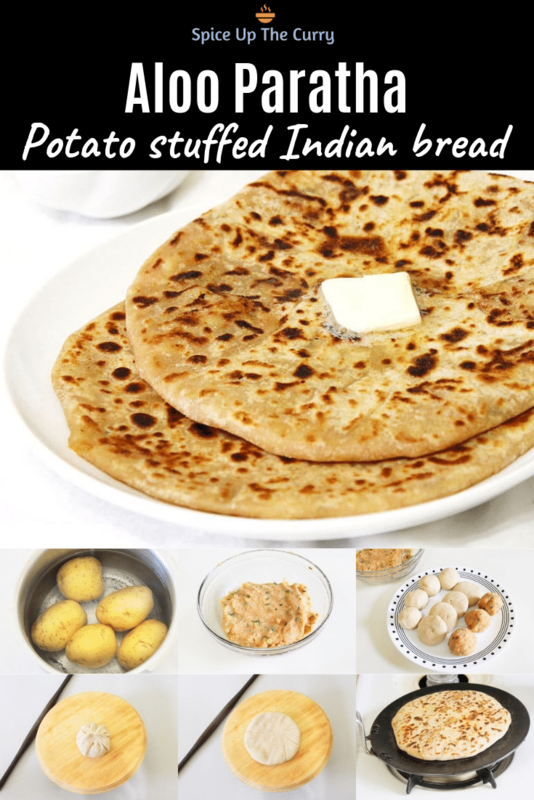 How to boil potatoes for aloo paratha? To boil the potatoes in the pressure cooker, take the potatoes in the cooker. Add enough water so potatoes are submerged in the water. Cook it for 2-3 whistles on medium heat. Let the pressure go down by itself then open the lid. The number of whistles may vary. It depends on the size and type of potatoes. Or you can cook potatoes in an instant pot. Remove the potatoes and let it cool to touch. Then peel the potatoes. How to make stuffing for aloo paratha? Mash the potatoes using a masher. Make sure to mash it well, don’t keep big chunks of potatoes. Otherwise, it will be harder to roll paratha. Mix in green chilies, cilantro, and grated ginger. Add salt, amchur, garam masala, red chili powder, and cumin powder. Mix it well. Best way to mix is ‘use your hands’. Take atta, salt, and oil in a bowl. Mix using fingertips. Add little water a time and start kneading the dough. Make a smooth and soft dough. Cover it and let it rest for 15 minutes. NOTE: Make the dough while boiled potatoes are cooling. and make stuffing while dough is resting to speed up the process. After 15 minutes knead the dough again one more time to make it smooth. divide it into 8 equal portions. Using your both palm, make a smooth ball and then flatten it out. Also, divide the potato stuffing into 8 portions. How to make Aloo Paratha? Take one flatten dough ball at time. Dip it into dry flour and roll into 3-4 inch diameter circle using rolling pin and board. Put one potato ball in the center, gather the edges as shown. Pinch it into the center to seal it properly. Flatten it using your hands very gently. Again dip into dry flour and roll into 6 inch diameter round. Roll it very very gently, making perfect paratha needs practice. Heat the tawa or griddle on medium heat. Once hot place the rolled paratha on it and cook for few seconds or till the you see few bubble on the top. Flip it and cook other side as well. Apply some oil on the surface. Flip again and cook it by pressing gently using spatula. As you press it will puff up if it is rolled properly. otherwise it won’t puff but that is fine it will taste great. Again apply some oil on top and also around the edges. flip it. Cook the other side as well by pressing lightly. Remove it to insulated container or serve directly to your family member’s plate. Repeat the same process for rest of the parathas. What to serve with aloo paratha? Traditionally the dollop of white butter or makhan is added on top right before serving. If Vegan, then skip the butter or use vegan butter. 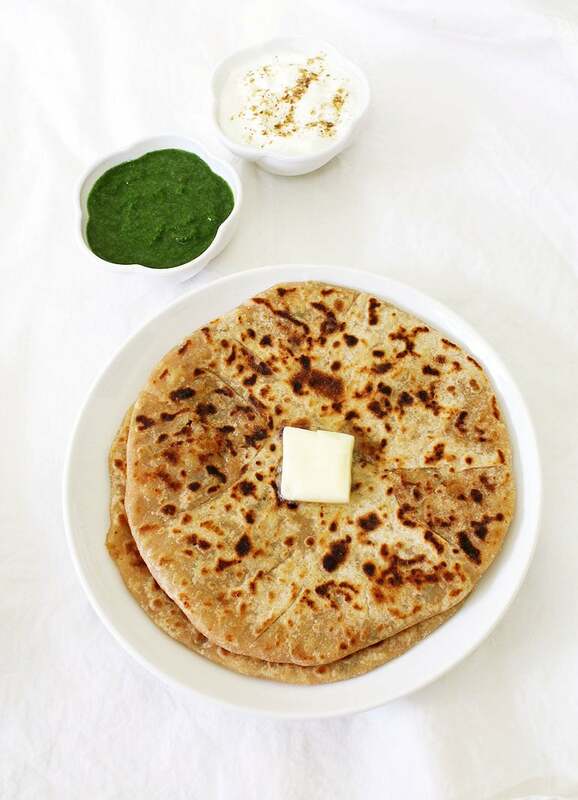 Aloo paratha is served with yogurt or raita,mint chutney or coriander chutney and pickle on side. The dough needs to be soft and smooth. If the dough is not smooth then it will give hard time rolling. If the dough is hard (not soft) then it will break while rolling and stuffing will come out from the edges. Mash the potatoes well. If there are any big chunks of potato, paratha will break while rolling. Let the stuffing cool completely before you start making the paratha. If it’s hot or warm, dough will get soft from the steam and will get sticky and break. More practice makes it perfect. If making for the first time, it will break. But it should not stop you making the next one. 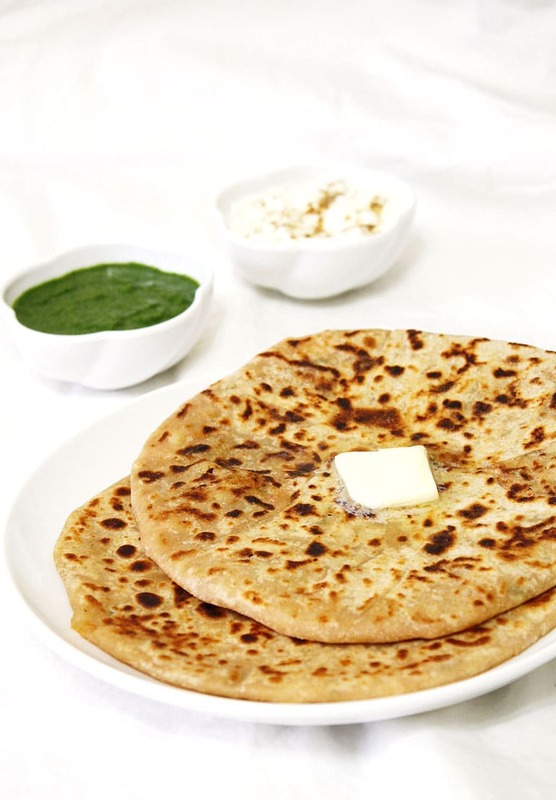 The BEST and easy aloo paratha recipe that is served as a breakfast or meal. It can be packed into lunch box for kids, adults. Boil the potatoes in pressure cooker. Once cool to touch peel and mash using potato masher. While potatoes are cooling, make the dough. Mix whole wheat flour, salt and oil in a bowl. Start adding little water at a time and knead into soft and smooth dough. Cover it and let it rest for 15 minutes. Meanwhile make the stuffing. Take mashed potatoes, green chilies, cilantro and grated ginger in a bowl and mix. Also mix in salt, amchur, garam masala, red chili powder and cumin powder. divide it into 8 equal portions. Keep it aside. After the dough resting time, knead the dough once again for 2-3 times to smooth it out and divide it into 8 equal portion. Make smooth ball and flatten it out into disc. Take one flatten ball, roll into 3-4 inch diameter circle. Put the stuffing inside and seal it by gathering the edges into the center. Flatten it using hand and roll into 6 inch diameter circle. Use dry flour to make rolling easy. Now heat the tawa on medium to fry the paratha. Fry them on hot tawa using oil till both sides gave golden brown spots. Repeat the same process for rest of the paratha. Perfect recipe! Thank you so much… the taste excactly like the ones i had in india many years ago! And they went great even for trying it for the first time. 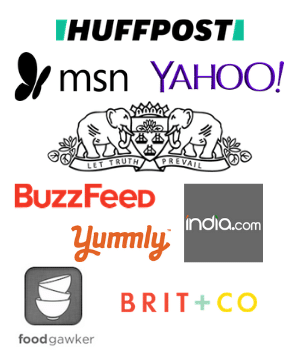 Thank you Janina for positive review. Thanks a lot, we are Punjabi too but we never use ginger especially in Parathas. To your list please , thanks. Ginger adds some flavor to it. But you can skip it too. Sorry As being vegetarian, I do not post chicken recipes.